Plasma blasts formed during memory immune responses emigrate from the spleen to migrate into the bone marrow and into chronically inflamed tissues where they differentiate into long-lived plasma cells. In this study, we analyze the chemokine responsiveness of plasma blasts formed after secondary immunization with OVA. Starting from day 4 and within ∼48 h, OVA-specific plasma blasts emigrate from spleen and appear in the bone marrow. Although these migratory cells have lost their responsiveness to many B cell attracting chemokines, e.g., CXC chemokine ligand (CXCL)13 (B lymphocyte chemoattractant), they migrate toward CXCL12 (stromal cell-derived factor 1α), and toward the inflammatory chemokines CXCL9 (monokine induced by IFN-γ), CXCL10 (IFN-γ-inducible protein 10), and CXCL11 (IFN-inducible T cell α chemoattractant). However, the responsiveness of plasma blasts to these chemokines is restricted to a few days after their emigration from the spleen, indicating a role for these molecules and their cognate receptors, i.e., CXCR3 and CXCR4, in the regulation of plasma blast migration into the bone marrow and/or inflamed tissues. Secretion of Ab into the body humors by plasma cells is a basic defense mechanism of the vertebrate immune system, but also can become an integral part of the pathology in autoimmune diseases and allergies (1). The production of Ab of high affinity for protein Ag requires T-B cell interaction in secondary lymphoid organs (2). Primary immunization results in the formation of Ab-secreting cells (ASC)3 in extrafollicular foci. Most of these ASC die within ∼1 wk in these foci (3). In contrast, most ASC formed during a memory response leave the splenic follicles to migrate to and maintain the humoral immune response either in the bone marrow (4, 5, 6) or in chronically inflamed tissues (7). Some plasma blasts migrate into the red pulp of the spleen where these cells also can persist for long periods of time (8). Chemokines and their receptors are crucially involved in the control of lymphocyte trafficking. Although, for example, CXC chemokine ligand (CXCL)12 typically mediates lymphocyte homeostasis, CXCL9, CXCL10, and CXCL11 are associated with lymphocyte migration into inflamed tissue (9, 10, 11). It has recently been suggested that CXCR4 is required for normal accumulation of plasma cells in the bone marrow (12). Whether other chemokine receptors besides CXCR4 are involved in the regulation of ASC migration into the bone marrow and which molecules direct ASC into inflamed tissues, has not been clarified yet. In this study, we analyze the localization and chemokine responsiveness of OVA-specific ASC during the time course of a memory response. At the time point of emigration of these cells from the spleen and only for a few days, ASC migrate toward a limited number of chemokines. 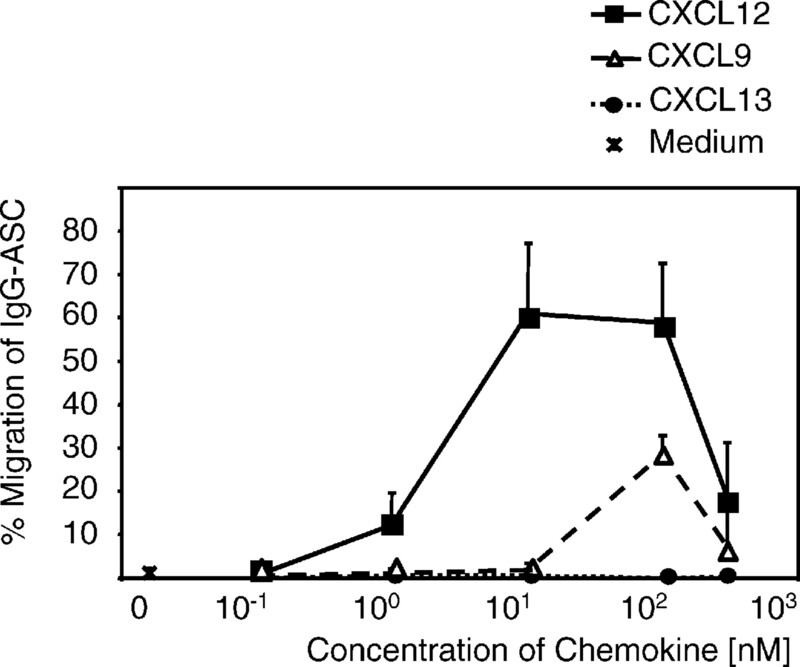 Besides CXCL12, the only known ligand for CXCR4, these chemokines include all ligands for CXCR3, i.e., the inflammatory chemokines CXCL9, CXCL10, and CXCL11. These results suggest that CXCR3 mediates the attraction of ASC into inflamed tissues. CXCR3 may also contribute supplementary to CXCR4 for the migration of ASC into the bone marrow. BALB/c female mice were bred at the animal facility of the Deutsches Rheuma Forschungszentrum Berlin (Berlin, Germany) under specific pathogen-free conditions. At the time point of primary immunization, the animals were 6–8 wk of age. Each mouse received 100 μg OVA (Sigma-Aldrich, Steinheim, Germany) precipitated in aluminum-magnesium-hydroxide (Imject-Alum; Pierce, Rockford, IL; 200 μl in PBS) injected i.p. After 3–6 wk, primed mice were immunized again by injection of 50 μg OVA in 100 μl PBS into the lateral tail vein. Single-cell suspensions from bone marrow (femurs) and spleen were filtered through a 70-μm cell strainer (BD Falcon, Bedford, MA), washed, and resuspended in RPMI 1640 medium (Life Technologies, Paisley, U.K.), supplemented with 10% FCS (Invitrogen, Carlsbad, CA), penicillin, streptomycin, and glutamine (complete medium). The standard ELISPOT technique (13) was modified as described, briefly: RIA plates (flat-bottom, high-binding; Corning, Corning, NY) were coated overnight at 4°C with OVA (Sigma-Aldrich) in PBS (5 μg/ml). Then, plates were incubated with PBS containing 3% BSA (Biomol, Hamburg, Germany) 1 h before adding the cells in various dilutions in complete medium. The cells were incubated for 2 h in a humid atmosphere with 5% CO2. Subsequently, cells were removed by vigorous washing with 3% BSA in PBS/0.01% Tween 20 (BSA/PBS/Tween). Between all following steps, plates were washed three times with BSA/PBS/Tween. Biotin-labeled goat anti-mouse IgG (Southern Biotechnology Associates, Birmingham, AL) in PBS (1 μg/ml) was added and plates were incubated for 30 min at room temperature. Following that, 50 μl streptavidin-alkaline phosphatase (Sigma-Aldrich) was added after a 30-min incubation at room temperature. 5-bromo-4-chloro-3-indolyl-phosphate (Sigma-Aldrich) was added to visualize spot formation: 5-bromo-4-chloro-3-indolyl-phosphate per was dissolved in 2-AMP-buffer (95 ml 2-amino-2-methyl-1-propanol, 0.1 ml Triton X-405, 150 mg/ml MgCl2, 900 ml Aqua dest, pH 10.25 adjusted with HCl) at a concentration of 1 mg/ml. The solution was mixed with melted agarose (type I, low electroendosmosis; Sigma-Aldrich) to obtain a final agarose concentration of 0.6%. The mixture was kept at 65°C for 30 min. After addition of the substrate, plates were cooled down to room temperature for solidification of the agarose. The plates were allowed to develop for 2 h at 37°C. Spots were counted under an inverted microscope. Total numbers of OVA-specific ASC in the bone marrow were calculated assuming that both femurs together contain 12.6% of the total bone marrow cells (14). All chemokines except for CC chemokine ligand (CCL)17 (thymus- and activation-regulated chemokine) were purchased from R&D Systems (Minneapolis, MN). Recombinant TARC was produced as recently described (15). TARC-producing cell line was kindly provided by I. Förster (Technical University of Munich, Munich, Germany). Chemotaxis assays were performed as described (16). Briefly, 24-well plates with Transwell inserts (6.5-mm diameter, 5 μm pores; Corning) and RPMI 1640 medium (Life Technologies) supplemented with 0.5% BSA (low endotoxin; Sigma-Aldrich) was used (assay medium). The inserts were coated with 50 μl of murine fibronectin (Invitrogen) at a concentration of 10 μg/ml in water and incubated for 1 h at 37°C in a humid atmosphere with 5% CO2. The solution was removed and the inserts were dried for 2 h at 37°C. Lymphocytes were isolated by gradient centrifugation (Histopaque-1083; Sigma Diagnostics, St. Louis, MO), washed, counted, and diluted in assay medium at a final concentration of 5 × 106 cells/ml. Before the chemotaxis assays, freshly harvested cells were kept in prewarmed (37°C) medium during the cell isolation procedure, taking ∼90 min (density gradient centrifugation and washing). The lower Transwell chamber was filled with 600 μl of chemokine solution, and 100 μl of the cell suspension was added to the upper chamber. Cells were allowed to migrate for 90 min at 37°C in a humid atmosphere with 5% CO2. Finally, the cells were collected from the lower Transwell compartment and from control samples containing total cells before migration. In both fractions, OVA-specific ASC were quantified by ELISPOT assay as described above and percentages of migrated cells were calculated. Functionality of the chemokines was tested by analyzing the migration of CD4-positive cells and eosinophils. Eosinophilic granulocytes were quantified in the input and after migration as follows: the cells were brought on glass slides by cytospin and stained with Giemsa’s solution, then they were assessed and counted under a microscope. The numbers of CD4-positive cells were quantified in the input and migrated population: triplicates of 500 μl aliquots for each chemokine and the medium control were added to a fixed amount of beads (TruCount; BD Biosciences, Mountain View, CA), Abs used for gating (anti-mouse CD4, H129.19) were added, and the number of cells and beads was counted without washing by FACS. Samples were analyzed on a FACSCaliber using CellQuest software (BD Biosciences). Single-cell suspensions prepared from bone marrow were washed twice in PBS/0.5% BSA. Cells were incubated with the primary staining reagents at titrated concentrations for 10 min on ice. Primary staining reagents were: FITC-conjugated OVA (OVA was purchased from Sigma-Aldrich and labeled with FITC according to the manufacturer’s protocols), anti-CD138-PE (clone 281-2; BD PharMingen, San Diego, CA), anti-CXCR4-biotin (anti-murine-CXCR4, clone 1D9, a generous gift from R. Förster, Institute of Immunology, Hannover Medical School, Hannover, Germany) was labeled with sulfosuccinimidyl-6-biotinamido-hexanoate (Pierce) according to the manufacturer’s protocols. Biotinylated, isotype-matched rat anti-mouse IL-12 (clone C17.8) has been used as control. For blocking of the CXCR4 staining, cells were preincubated with 100-fold excess of unlabeled anti-CXCR4 Ab. After washing, the cells were stained with streptavidin coupled to allophycocyanin as secondary reagent. Cytometric analysis was performed using a LSR cytometer (BD Biosciences). Samples were stained with propidium iodide. Dead cells, debris, and RBCs were electronically excluded by gating. For analysis, CellQuest software (BD Biosciences) was used. 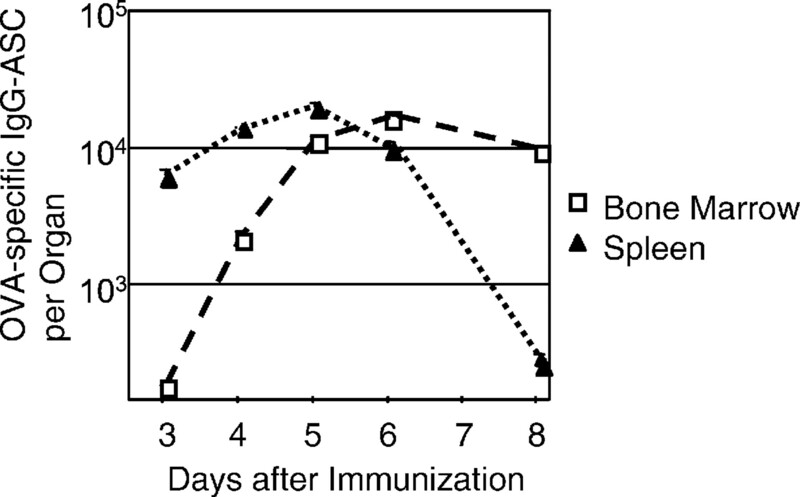 The numbers of OVA-specific IgG-secreting cells, i.e., plasma blasts, in spleen and bone marrow were determined by ELISPOT at daily intervals between days 3 and 6 after secondary immunization (Fig. 1⇓). In the spleen, where the immune response was initiated, these cells reached peak numbers at days 4 and 5, before decreasing 10- to 50-fold during the following 2 days. At the same time, i.e., between days 4 and 6 after secondary immunization, OVA-specific ASC appeared in the bone marrow where their numbers peaked at day 6. These data show that the migration of OVA-specific ASC from spleen into the bone marrow occurred basically within the narrow time window between days 4 and 6 after secondary immunization. The numbers of ASC in the blood peaked at that time but were altogether <1000 cells in 1 ml. The obvious lack of accumulation in the blood suggests that individual plasma blasts circulate only for a short period of time and are already determined to migrate to their final destinations. Similar results had earlier been observed after immunization with lymphocytic choriomeningitis virus, hapten-coupled protein, and sheep erythrocytes (3, 17, 18, 19), indicating that the rapid PC formation and migration into the bone marrow observed in our study is a general phenomenon. Within 2 days, IgG-ASC emigrate from the spleen and appear in the bone marrow. BALB/c mice were immunized and boosted with OVA. At the time points indicated, mice were sacrificed and OVA-specific IgG-ASC were identified by ELISPOT. Total numbers of these cells in spleen and bone marrow were calculated as described in Materials and Methods. Pooled cells from three to five mice for each time point and organ were analyzed, the data show one representative experiment of three. To identify the chemokines and their cognate receptors involved in this migratory process, we analyzed OVA-specific ASC isolated at the time point when the cells start to leave the spleen, i.e., at day 4 after immunization, for their chemotactic response in vitro. A recent report by Bowman et al. (20) indicates that chemokines selectively recruit PC secreting Ab of different isotypes. It should be noted that the studies presented focus on the migration of IgG-secreting cells, the predominant isotype of the persistent humoral memory response against OVA in our immunization protocol (our unpublished results). Chemokines were tested at concentrations between 0.1 and 300 nM. About 60% of the IgG-ASC migrated toward CXCL12 (stromal cell-derived factor 1α) at the optimal concentration ranging between 10 and 100 nM (Fig. 2⇓). About 30% of these cells migrated toward CXCL9 (monokine induced by IFN-γ) at a concentration of 100 nM. Migration toward medium alone was <1.5% (basal migration). Migration toward CXCL9 and CXCL12 was blocked to basal level (<1.5%) by addition of these chemokines into the upper and lower Transwell chamber in equivalent concentrations (checkerboard assay), indicating that the migration could be due to chemotaxis and not to chemokinesis. Notably, and in accord with two recent reports (12, 21), no response has been detected to CXCL13 (B lymphocyte chemoattractant), CCL19 (EBI 1 ligand chemokine), and CCL21 (secondary lymphoid tissue chemokine), as shown in Fig. 2⇓ and Table I⇓, respectively. These chemokines are important for B cell localization in the various zones of secondary lymphoid organs (22). Chemotaxis of IgG-ASC toward chemokine gradients. Cells were isolated from murine spleen at day 4 after secondary immunization with OVA. Chemotaxis was determined by the Transwell system, OVA-specific IgG-ASC were enumerated by ELISPOT. The percentage of input OVA-specific IgG-ASC that migrated to the lower chamber of the Transwells is shown. Data shown are the average of three independent experiments tested in triplicates with cells pooled from two mice per experiment. Error bars represent SD. The numbers of IgG-secreting cells were 548 ± 153 cells/5 × 105 total spleen cells plated. About 30 and 10% of OVA-specific IgG-ASC migrated in response to 100 nM CXCL10 (IFN-γ-inducible protein 10) and 100 nM CXCL11 (IFN-inducible T cell α chemoattractant), respectively (data not shown). For all other chemokines tested, no migration above the basal level could be detected (Table I⇑). As far as possible, the functionality of the chemokines used was tested on other cell types, as shown in Table II⇓. Although our results cannot formally exclude the possibility for other chemokines to be involved in the regulation of plasma blast migration, our study has identified a number of chemokines which can attract plasma blasts formed in secondary immune responses, i.e., CXCL9, CXCL10, CXCL11, and CXCL12. The cognate receptors for these chemokines are CXCR3 and CXCR4, respectively (19, 23, 24, 25). Our results indicate that CXCR3 and CXCR4 are functionally expressed on IgG-secreting plasma blasts formed in secondary immune responses, at a time point when they leave the spleen. Fig. 1⇑ indicates that OVA-specific plasma blasts, formed within the first 4–5 days after secondary immunization in the spleen, enter the bone marrow between days 5 and 6. We tested CXCL12 and CXCL9 for their potential to attract ASC harvested from bone marrow at various time points (Fig. 3⇓). 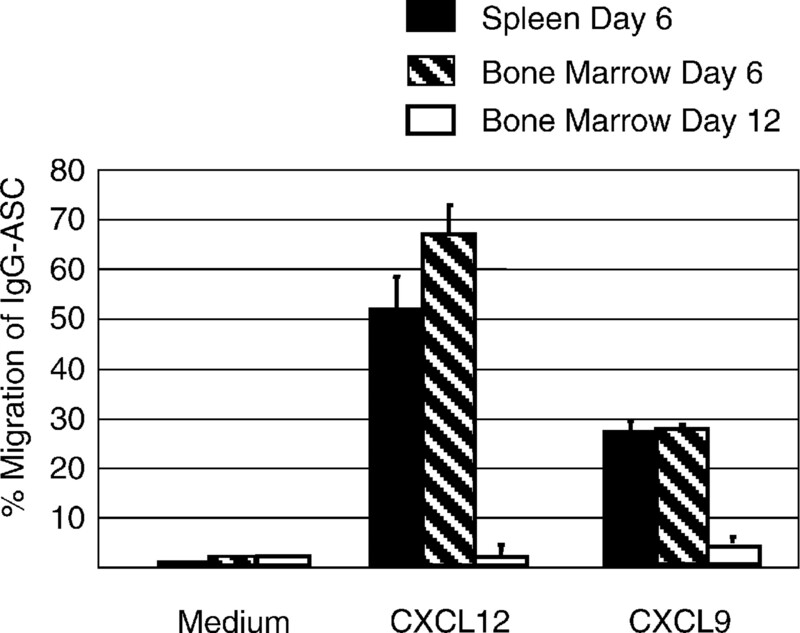 At day 6 after immunization, OVA-specific ASC from bone marrow migrated as well toward optimal concentrations of CXCL9 and CXCL12 as ASC from spleen. The percentage of responsive ASC at that time point was not different from that observed in splenic ASC at day 4. However, at day 12 after immunization, bone marrow ASC had completely lost their capacity to migrate toward CXCL9 and CXCL12 at those concentrations optimal for day 4 splenic ASC (Fig. 3⇓), and in concentrations between 0.1 and 300 nM (data not shown). A 3-h period of preincubation at 37°C before the chemotaxis assay did not restore the ability of day 12 bone marrow ASC, nor did this prevent day 6 bone marrow ASC from migrating toward these chemokines. Within 6 days after arrival in the bone marrow, IgG-ASC lose the responsiveness toward CXCR3 and CXCR4 ligands. Cells were isolated from murine spleen and bone marrow at days 6 or 12 after secondary immunization with OVA. Chemotaxis was determined by the Transwell system, OVA-specific IgG-ASC were enumerated by ELISPOT. CXCL9 and CXCL12 were used at a concentration of 100 and 10 nM, respectively. The percentage of input OVA-specific IgG-ASC that migrated to the lower chamber of the Transwells in one representative experiment of three is shown. The numbers of IgG-secreting cells per 5 × 105 total cells plated were 398 (bone marrow cells at day 12), 374 (bone marrow cells at day 6), and 166 (spleen cells at day 6). The change in the chemotactic responsiveness of PC and their limited time period of migration into the bone marrow argue against a continuous formation of short-lived PC renewing the bone marrow PC population as hypothesized earlier (1), andare in accord with experiments showing that the population of PC persisting in the bone marrow consists of long-lived cells(4, 5, 26). To determine whether PC down-regulate surface CXCR4 expression after entry into the bone marrow, CXCR4 expression was analyzed by FACS on OVA-specific PC at days 6 and 12 after secondary immunization. OVA-specific PC were identified by staining for the PC surrogate marker CD138 together with Ag (3, 27). A population of ∼0.1% of these cells was detected in the bone marrow after secondary immunization (Fig. 4⇓A). The staining “background” in nonimmunized controls was below a frequency of 0.01%. 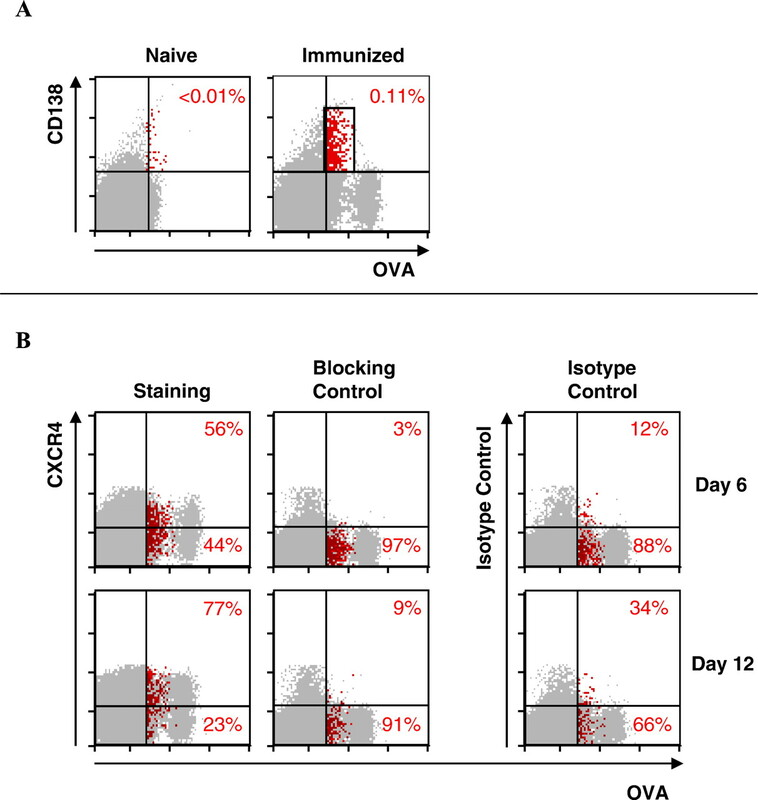 Despite the absence of chemotactic responsiveness toward CXCL12, CXCR4 is expressed on 77% of the OVA-specific PC derived from the bone marrow at day 12 after immunization (Fig. 4⇓B). Specificity of the CXCR4 staining was controlled by staining with an isotype-matched irrelevant Ab and by incubation with unlabeled Ab before CXCR4 staining. CXCR4 seemed to be rather up-regulated at day 12 compared with day 6 bone marrow PC. Uncoupling of CXCR4 surface expression to migration and signaling by an unknown mechanism has been described for hematopoietic stem cells and B cells, respectively (28, 29). We assume that CXCR4 on these bone marrow PC may serve a function different from mediating chemotaxis, possibly mediating anti-apoptotic signals and supporting cellular survival, as shown for T cells and peritoneal B cells, respectively (30, 31). The presence of mRNA for CXCR4 has been detected on PC derived from peripheral lymph nodes (21). However, these cells did not migrate toward CXCL12. In another report, splenic PC migrated well toward CXCL12 (12). Our results show that the chemotactic responsiveness toward CXCL12, but not expression of CXCR4, depends on the time point after immunization and PC localization, possibly explaining the apparently contradicting results on CXCR4 expression and responsiveness to CXCL12. A, Expression of CXCR4 on total bone marrow cells. OVA-specific PC were identified by the expression of CD138 together with their ability to bind Ag in immunized and control animals. B, Cells were stained for CXCR4, specificity of the staining was confirmed by preincubation of the cells with an excess of unlabeled Ab (blocking control) and by an isotype-matched control. For each sample, 500,000 total cells were acquired, cells were gated electronically to exclude dead cells and debris. Fluorescence intensity is shown in a logarithmic scale. Red dots represent OVA-specific PC. Frequencies of OVA-specific PC are indicated by red numbers in the various quadrants. Memory Ab titers are produced by a population of PC formed in secondary lymphoid organs migrating and persisting in the bone marrow (6, 19, 32). The capacity of PC to migrate into the bone marrow seems to be critical for the development of persisting Ab responses (33). Chemokines and their cognate receptors usually are important regulators of cell migration. Changes of chemokine responsiveness had been observed during differentiation of PC derived from lymph nodes after primary immunization (21), indicating that these changes may be crucial for emigration from this tissue. To gain information about the regulation of PC migration into the bone marrow, we analyzed the migration and chemokine responsiveness of IgG-secreting PC specific for the protein Ag OVA during the time course of a secondary immune response. In this study, we show that the responsiveness of plasma blasts toward CXCR3 and CXCR4 ligands is restricted to the period of their emigration from spleen and migration into the bone marrow, suggesting a role for these receptors in the regulation of this process. It has been shown recently that plasma cells in CXCR4-deficient fetal liver chimeras accumulate in the bone marrow in ∼3-fold reduced numbers, showing that this receptor is responsible for either migration into or retention of PC in the bone marrow (12). Whether CXCR3 is also involved in directing plasma blasts into the bone marrow and responsible for the remaining accumulation of these cells in the bone marrow of CXCR4-deficient chimeras remains to be elucidated. In several autoimmune diseases, plasma cells have been detected in chronically inflamed tissue (7, 34, 35). Among these cells are those secreting autoantibodies (7, 34). Through the generation of high local autoantibody concentrations, plasma cells that lodge in the affected inflamed tissue may contribute specifically to the pathogenesis of the disease. We have recently described the accumulation of plasma cells formed in the spleen in the inflamed kidneys of NZB/W F1 mice (36), a model for autoimmune systemic lupus erythematosus (37). Due to the effective migration of plasma blasts into these inflamed organs, plasma cells are found in the kidneys of these mice in numbers comparable to those in the bone marrow. The specificity of the immigrating plasma blasts was not restricted to self-Ag. OVA-specific plasma cells formed a few days after secondary immunization in the spleen lodged in the inflamed kidneys at later time points, indicating that, independent of their specificity, plasma blasts have the capacity to migrate into inflamed tissues (36). In this study, we show that during their migratory phase, such plasma blasts migrate toward the CXCR3 ligands CXCL9, CXCL10, and CXCL11. Using quantitative PCR, we detected an at least 1000-fold increase in the mRNA expression of CXCL10 in the inflamed kidneys of NZB/W mice as compared with the kidneys of healthy controls (data not shown). It has been shown that the ligands for CXCR3 are expressed in various inflamed tissues, including the kidneys of patients suffering from glomerulonephritis (38). It is also well documented that CXCR3 is a key player in the recruitment of T cells to sites of inflammation (9, 39, 40, 41). CXCR3 has been detected recently on a subset of human tonsillar PC of unknown descent and designation (42). We suppose that during their short period of circulation through the blood, CXCR3 and its ligands crucially contribute to directing plasma blasts into inflamed tissues. At least 30% of these cells migrate toward ligands for CXCR3; and therefore, are likely attracted to sites of inflammation while ∼60% of circulating plasma blasts migrate toward CXCL12 (Fig. 2⇑) and possibly can migrate into the bone marrow. Whether both receptors are expressed together on an individual cell, or whether CXCR3 and CXCR4 are expressed on distinct plasma blast subpopulations remains to be investigated. We thank Prof. Reinhold Förster for providing mAbs against CXCR4 and Anette Peddinghaus for excellent technical assistance. ↵1 This work was supported by the European Union Grant QLK2-CT-2001-01205 (MEMOVAX) and by the Deutsche Forschungsgemeinschaft Grant nos. MA 2273 and SFB421. 3 Abbreviations used in this paper: ASC, Ab-secreting cell; PC, plasma cell; CXCL, CXC chemokine ligand; CCL, CC chemokine ligand. Benner, R. A., A. Van Qudenaren, G. Koch. 1981. Induction of antibody formation in mouse bone marrow. B. Pernis, and I. Levkovits, eds. In Immunological Methods Vol. II: 247 Academic, New York.